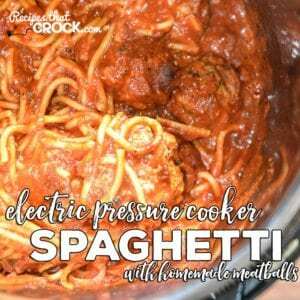 Electric Pressure Cooker Spaghetti with Homemade Meatballs - Recipes That Crock! Are you looking for a good Electric Pressure Cooker Recipe for your Instant Pot? 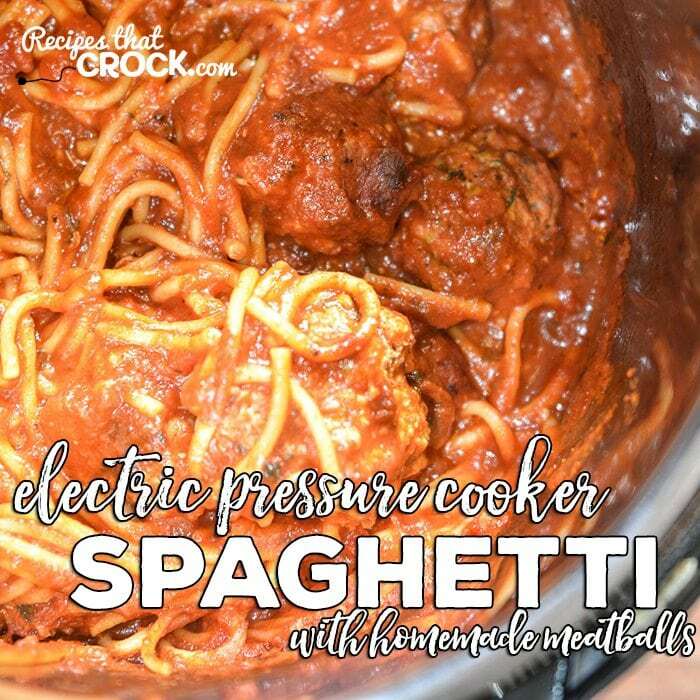 Our Electric Pressure Cooker Spaghetti with Homemade Meatballs is simple to make, quick to cook and so good! Earlier this week I shared that we were having Instant Pot Spaghetti with Homemade Meatballs in our weekly menu planning post AND during our weekly chat video. I shared that I was in the final testing stages of this new pressure cooker recipe for the site and I have heard from many of you that you wanted me to share it as soon as it was ready to share… so here it is! This is not a crock pot recipe. 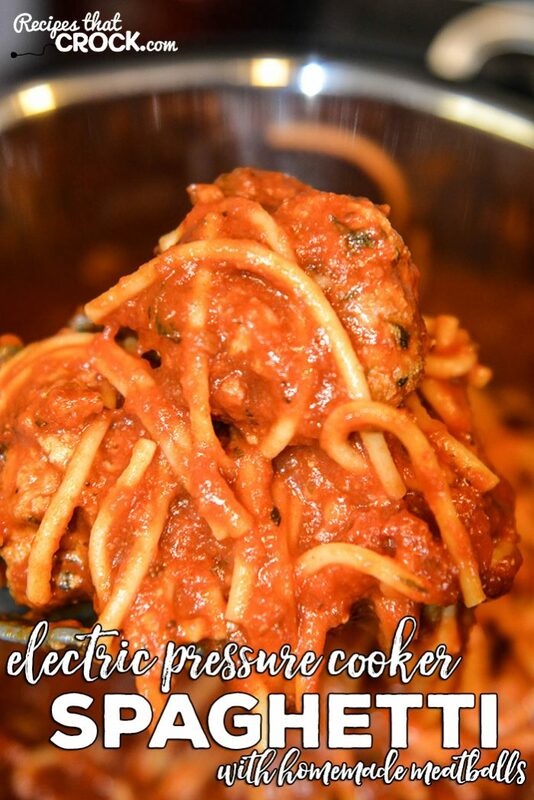 If you are looking for a slow cooker version, here is our crock pot spaghetti with homemade meatballs. Do not use the warming setting on your pressure cooker. It will scorch the bottom of your dish. If you are feeding more people, you can double the amount of pasta as long as you double the amount of water. Just make sure you are using a 6 quart pressure cooker, a smaller unit will boil over. Pour one jar of sauce into the bottom of your 6 quart electric pressure cooker. Place the meatballs in your pressure cooker in a single layer and then top with other jar of sauce. Sprinkle broken pasta pieces on top of sauce and cover with your water. Seal your pressure cooker and set to manual (with warm setting off) high pressure and set unit to 5 minutes. Once your unit reaches 5 minutes on high pressure and shuts off, turn valve to quick release. Once steam is done releasing, remove lid immediately and stir well before serving. All electric pressure cookers differently, so cooking times are always a basic guideline. Recipes should always be tested first in your own unit and time adjusted as needed. I made this tonight and it’s delicious!!! I was confused about one thing though…my IP never came up to enough pressure to pop up the exhaust valve. Is that right?? I kept resetting it but it never did pop up. Everything finally got cooked but it wasn’t in the first 5 min round. Did I do something wrong? So glad you enjoyed it. It does sound like something might not be operating correctly. It sounds like it did not seal properly. You may want to check your manual to troubleshoot. I want to try this recipe with whole grain pasta. Do I have to adjust the time? It cooks faster than regular pasta and I read that you pressure cook pasta for half the time on the package. So, recipe time would be 4 to 4 1/2 minutes, not the 5 like the recipe says. I am not sure I would reduce the cooking time given the recipe includes raw meatballs that need to cook through. Is two jars of sauce necessary? Would one larger 32 oz sauce work? My kids like light sauce with their spaghetti. How how can I adjust the recipe to make more pasta such as using 16 oz instead of 8 oz? I recently got an instant pot and am learning how to best cook pasta in it so that it’s not soggy. Thanks! I really can’t say. Before I put a recipe on the site I test it and re-test it (and sometimes test it a LOT more in the case of the electric pressure cooker recipes) and then I share what worked for me. Unfortunately, without testing the changes you want to make, I don’t feel comfortable making suggestions. My guess is you could probably get away with less sauce.. And as for the pasta the first thing I would try if I was testing would be to double the water. But in that case, I would probably still use 48oz of sauce. Again, I haven’t tested it, but if you do give it a try, I’d love to know how it goes. – Enjoy! Thank you for this easy and delicious recipe! It was my first time to cook pasta that way, and I wasn’t sure how it would go, but it worked and only dirtied one pot. Nice! Not sure what you mean by turning the warm setting off. I’ve only used it a few times so I’m quite unfamiliar with the settings. If you could help me out I’d really appreciate it! Can’t wait to try this!! On the instant pot when you press the manual button the warming light will turn on in your panel. If you press the manual button a second time, that light will turn off. Hope that helps! I’m so glad that I found ya’ll. You two are so funny. Mikey looks like my son-in-law. I found ya’ll this past Friday. I was watching one of your videos while I as cooking and when my husband came home from work he saw Mikey on my computer and asked if he was our son-in-law. I told him no but I had thought the same thing. I told my son-in-law that he had a doppelganger. Any way, sorry about the long story. I just had a question about the spaghetti recipe. Is the cooking time from when the pot seals itself or from when you put the lid on and start the time? I’m new to this pot also. Hi Vivian! That is too funny!! As for the timing, it starts from the seal. I set the timer on my pot and it starts counting down once the seal takes. Enjoy! We made this tonight for dinner! I have never seen a grown man have so much fun figuring out how the pot works. We made this with frozen meatballs, and angel hair spaghetti, since that is what we had in the cupboard. It came out really well. I do wonder how it would turn out if you mixed a red sauce with a jar of alfredo type sauce? This was so good, and hit that comfort food spot for us. I am sensing a lot more uses coming for our new addition to the kitchen! First, I want to tell you how much I am enjoying all of your recipes, and shows. Am especially enjoying the weekly menu shows. I recently got a very good deal on an Instant Pot and am anxious to try making lots of yummy things in it, however, it is rather intimidating. But, thanks to you, it doesn’t seem as daunting as it did. I am a Slow Cooker and have a few different ones, not as many as you guys have, but am working on that. I had been using the traditional pressure cooker until I saw the Instant Pot, but am not sure if the same recipes will work in the electric. I must admit that am not a very good cook, or an avid cook, so am always looking for an easy way to cook good food. The dump recipes are super, so can you please help me out with more of the veggie, grain, rice kind of dishes both for Slow Cooker and Instant Pot? We are pretty new to the electric pressure cookers too but we are willing to learn together 😉 You will always be able to find the recipes we have tested for the Instant Pot here: http://www.recipesthatcrock.com/category/electric-pressure-cookerinstant-pot/ . The rest of the site is entirely slow cooker, so definitely check out our side dishes section for more ideas. We are so glad you are enjoying the shows! We have this pressure cooker and love it! We made pork ribs in it and they came out quite good! Question? Can you use frozen pre made meatballs in this recipe? Thanks so much! Hi Rebecca- I haven’t tried it, but I bet they’d do okay. Let me know if you try it! I have tried the frozen meatballs in this recipe, and they were excellent. The ones I used was the Walmart, Great Value, Italian Style. Some frozen meatballs are horrible. Do you think this would work well with turkey? I haven’t tried it, but I would be a little concerned that they might turn out dry. You might try half turkey half pork or beef… Or if you go all turkey, try to find a dark meat ground turkey which will have a higher fat count than the lean white meat ground turkey. Regardless, if you try it, let me know how it goes! Enjoy! This looks delicious! I am thinking of buying a pressure cooker. Hi Joanne- Definitely tune in to our weekly chat this weekend (in the weekly meal planning post) we are going to be talking about the different ones we own. Enjoy! I have been using the Cuisinart electric pressure cooker for 3 years now. I LOVE IT. Especially in summer when it cuts down on cooking time in this hot Arkansas kitchen. More and more recipes are coming out every day online. To cook a meat from frozen stage to fork cutting tenderness in less than 20 mins is amazing to me. Good luck in your purchase. So do I just put the water on top of everything after I add the noodles we noodles?